Are you sort of figuring out how my brain works now? 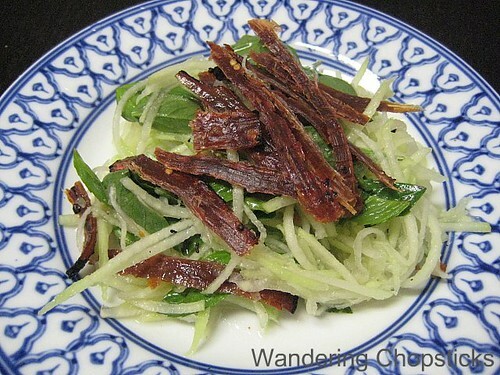 I show you pictures of papaya trees with green papaya, then I present a recipe for Goi Du Du Kho Bo (Vietnamese Green Papaya Salad with Beef Jerky). Although, the salad actually came before the papaya. This salad was made back in January. Green papaya is not sweet, so it's more like a vegetable than a fruit. Very Atkins, low-carb, South Beach Diet-friendly. If that's your thing. There are actually two types of Vietnamese green papaya salad. The kind you see pictured here with beef jerky, and a shrimp and pork version that's a little bit more similar to Thai papaya salad. You can find kho bo (Vietnamese beef jerky) at most Asian grocery stores, or substitute with a good quality fresh beef jerky. I'm using the jerky I bought from Vua Kho Bo (New Jerky Mfg. Inc.) - San Gabriel. Another option is to serve this with fried liver slices, but that's never quite appealed to me. 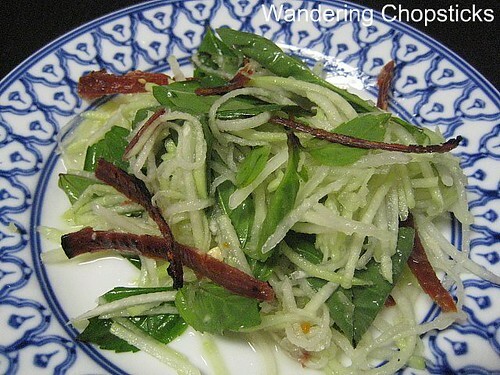 You can peel and julienne green papaya for this dish. Or cheat, like I did, and buy some pre-shredded at most Asian grocery stores. :P If you are using fresh papaya, make sure you soak the shredded papaya in salty water for about 15 minutes to remove any lingering waxiness. Drain into a colander and squeeze out excess water before using. You don't need to do this if you buy the pre-shredded papaya as it is already soaking in water. Pre-shredded papaya spoils quickly so make this salad within a day of purchasing it. If you're shredding your own green papaya, prepare that first and set aside in a bowl of salty water. Prepare the dressing by mixing 1/4 cup soy sauce, 1/4 cup vinegar, 1/2 cup water, 1 tblsp sugar, and 2 tsp chili sauce. Taste. Adjust if necessary but you want a slightly sweet sauce. Set aside. Grill the beef jerky over a gas burner like the photo below until both sides are lightly toasted. You can also use a toaster oven, or even a toaster if you're desperate. Tear into small strips. Set aside. Drain papaya into a colander and lightly press to remove excess moisture. Leave the papaya in the colander to continue draining while you prepare the Thai basil leaves. Remove the basil leaves from the stem. The leaves can remain whole or chiffonade if you wish. Now it's time to add it all together. In a bowl, add in the drained papaya and basil leaves. Give the dressing a quick stir and pour in about half of it. Toss. Taste. Add more dressing if necessary but you don't want it too wet. To serve, arrange the salad on a plate. Add the beef jerky strips on top. When you eat, the diner can toss the salad themselves like the photo below. Leaving the beef jerky on top before serving prevents it from becoming soggy. If you liked this, you might also like my recipe for Goi Xoai Xanh (Vietnamese Green Mango Salad). You can order this dish at most Vietnamese restaurants. If you're having a big party, I've ordered catering trays from Banh Mi & Che Cali Restaurant in Alhambra for $20. The soy sauce dressing is stored in a separate container and tightly sealed. See pictures of the trays at the family wedding last summer and my dad's 60th birthday party. Who else made goi du du? 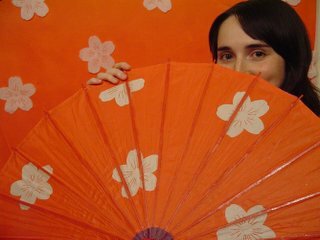 Christine of Holy Basil has photos of three kinds of implements for shredding papaya. Peachy Mango Delight added rau ram (Vietnamese coriander). I'm submitting this recipe to Weekend Herb Blogging, a world-wide food blogging event created by Kalyn's Kitchen celebrating herbs, vegetables, or flowers. If you'd like to participate, see who's hosting next week. WHB is hosted this week by fellow Vietnamese food blogger Anh of Food Lover's Journey. 1 year ago today, my second-youngest uncle's com ga Hai Nam (Hainanese chicken rice). its been a long while i havent eaten green papayas..thats why staring at these photos truly gives me envies.. the combination of beef and green papaya in a salad sounds lovely!! This stuff is major delici-yoso....too bad most of the places here in SD don't make it. But now with your recipe...maybe we'll try it ourselves. You know, I never thought to toast the beef jerky - I'll have to try that next time. I'll have to check out your recipe for green mango salad too. I have to substitute firm, regular mangoes here because it's difficult to come by the green variety. You've reminded me about those tubs of pre-shredded papaya - a great way to buy just the amount you need. Some people wring their papaya dry I wonder why. I like the colours of this salad. I have tasted thai salad with mango but not with papaya! This is new to me. Yummy papaya!! Beef jerky is my salad picker upper when we eat too much dinner and there's no more leftovers for my lunch. I should try toasting it next time though, usually I just shred and toss. Yum! Sounds like my kind of dish. Must look for that beef jerky some time. What does the toasting do? Is it for extra crispiness? I love green papaya, but haven't ever had this type of salad with the Vietnamese touch. The Vietnamese beef jerky is so interesting. Would LOVE to try this. i wish i could find a shop that sold pre-shredded papaya! thanks for sharing this recipe. it looks like a great healthy dinner with a good zing of flavour involved. Yeah, it's Sunday, Nail shop day! We're almost done here, so they all got a treat to sneak into your blog today. Vi loves the salad, she says you are such a talented cook. Hong says that she toasts the beef too and that you are very clever and smart. This is my first time here, this looks so yummy! I will be back. Really? This salad is so simple. I'm really surprised to hear that. I hope you and the missus do have a go at it then. My family always toasts our beef jerky. Don't think it would occur to me not to toast it. And green mangoes really aren't green, are they? Those tubs are great for when I don't want to buy a whole lot of bamboo or lotus roots too! I think it's to reduce the moisture content even more. The salad can get a bit soggy after a while. You've never had a Thai papaya salad either? That's more common than mango salads, I would think. Ah, we always seem to be on the same wavelength. And I know you've got that beef jerky for tapa handy as a substitute. Yup, quick and easy. Shred and toss is the way to go! Toasting brings out the flavor of the jerky. Perks it up a bit. Try it and see if you like it more. You're the opposite of me b/c I adore papaya. You can try making this with regular beef jerky. Just choose a flat kind that's similar. The pre-shredded papaya saves so much work. 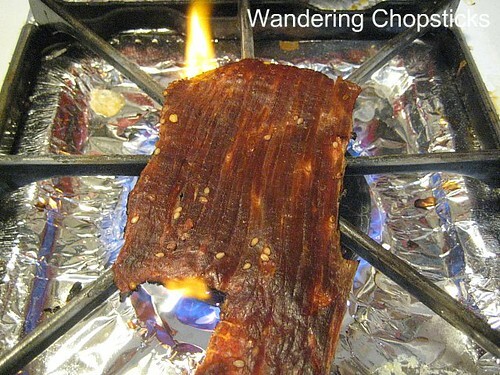 ooh I love beef jerky and have never seen a recipe to use it in, much less ever heated it over the stove! A revelation! I hope you try the recipe then! Hi, what kind/brand of soy sauce are you using? I've tried Maggi and another brand, but it just didn't taste right. Thanks! Never mind. I asked my sister-in-law, she told me what kind & brand of soy sauce to buy. I bought it, mixed the sauce and had it with shredded papaya, basil and Vietnamese style beef jerky (sweet & spicy). It tasted perfectly - as I remembered it...in Vietnam. The soy sauce brand name is Bo Da Chay Soy Sauce. It's vegetarian soy sauce. Enjoy! You mean La Bo De (Bodhi Leaf) brand? That's a good one. I also like Golden Mountain brand soy sauce.